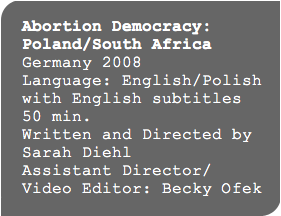 Sarah Diehl is a journalist, filmmaker and writer from Berlin, Germany. (Deproduktion - Abortion in an International Context), Alibri Verlag, 2007). Her novel Eskimo Limon 9 is released by Atrium Publishers in 2012 in Germany. She is currently working on her second documentary film "Pregnant Journeys"
about women in Europe, Africa and Latin America who organize access to safe abortions even though it is illegalized in their countries.